Location: West side of Attimore Hall level crossing. The road was realigned in the mid 1960s and moved approximately 60 yards to the west. The original road alignment follows the tree line along the edge of a small wood. Notes: Although the 1" OS map below appears to show the halt on the east side of the road, neither the house or the siding shown on the larger scale maps are visible in the picture so the halt must have been sited on the west side of the road on the down side of the line. It had a short low platform with no buildings, signs or lights. The crossing keepers house was sited on the opposite side of the crossing, also on the up side. Attimore Hall siding on the east side the road predated the halt and remained in use after the halt closed. By 1938 there was a second siding from it serving a felts and damp courses factory. The siding closed on 4.5.1964. In the mid 1960s the road passing the halt was realigned approximately 60 yards to the west as Welwyn Garden City expanded; the new road is called Ridgeway. 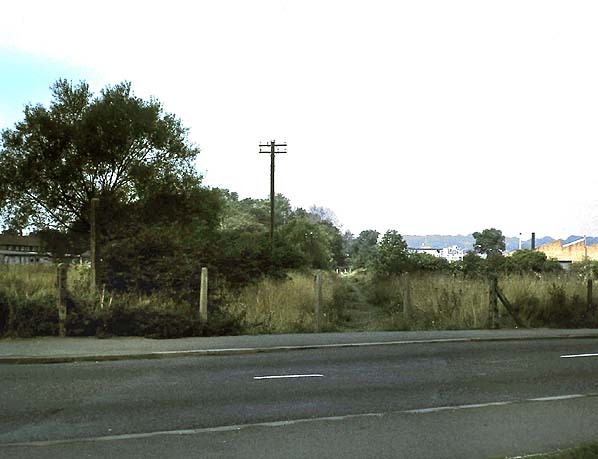 After closure of the Hollywell Hyde landfill site on 25th May 1966 the line was cut back to a point just west of Ridgeway in July 1967 with the remaining track lifted in 1982 following the closure of the GKN Ltd and Norton Abrasives siding on 16th November 1981. Unfortunately the company was unable to raise sufficient capital to purchase all the necessary land between Welwyn and Luton. The LNWR refused to help by leasing the line although they did offer to work the line for two years after completion. In an attempt to save the line an amalgamation between the H & WJR and the LD & WJR was proposed. This was bitterly opposed by a minority of disgruntled Luton shareholders who claimed that passengers would be forced to travel to London via the Eastern Counties main line at Hertford rather than using the shorter GNR route via Hatfield. The amalgamation was passed at a heated meeting on 26th January 1858, but although both lines were completed and approach embankments were constructed, the linking bridge was never built due to restrictions imposed by the GNR, nor were the triangular junctions which would have allowed trains to run north into Digswell. Work at the Welwyn end of the line had started in April 1856, but little was done. The formation of the Hertford, Luton & Dunstable Railway was authorised by parliament on 28th June 1858 with new capital available to complete the line. On 28th January 1859 work was once again underway, and there was even a second 'cutting of the first sod' ceremony. On 19th April 1860 the H & LDR informed both the Eastern Counties Railway and the GNR that they were terminating the 1858 agreement. The GNR immediately took steps to take over the line because of its strategic importance as a link between the three main lines; a Parliamentary Bill was prepared to facilitate this. At this time the line was nearing completion, with a special train carrying LNWR officials on 12th June and another 'special' on 17th July for company shareholders. After passing its Board of Trade inspection, the line between Luton and the Great Northern was opened to both goods and passenger traffic on 1st September 1860. In 1920 the new town of Welwyn Garden City was founded by Sir Ebenezer Howard, following his previous experiment in Letchworth Garden City. Howard had called for the creation of planned towns that were to combine the benefits of the city and the countryside and to avoid the disadvantages of both. During the construction of the new town, temporary contractors’ halts were provided at the junction of both the Hertford and Luton lines, close to the site of the earlier Welwyn Junction station. On 14th August 1920 the halt on the Luton line became a public station, known as Welwyn Garden City Halt; however the halt on the Hertford line did not and was closed once the construction of Welwyn Garden City had been completed. In common with many other branch lines, passenger numbers went into rapid decline after the war. In 1950 there were 5 down trains on weekdays with an extra train on Saturdays. There were 6 up trains on weekdays and 7 on Saturdays, and no Sunday service. It came as no surprise when closure was announced for 18th June 1951. The last train, the 7.18 pm service from Hertford North saw a number of passengers wearing Victorian costume to commemorate the passing of the line. 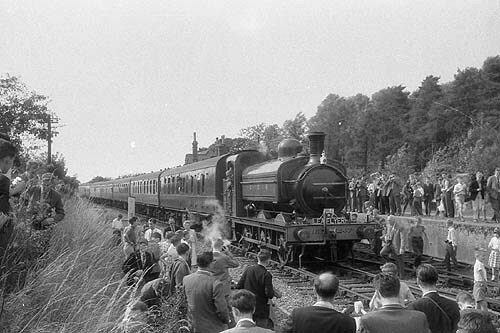 The last two passenger service to use the line were railtours, an unadvertised Welwyn - Hertford branch railtour organised by the Stephenson Locomotive Society on 21st November 1959. Passengers arrived at Welwyn Garden City by service train from Kings Cross. They then transferred to a 2-car Cravens DMU for the journey to Hertford East via Cowbridge where they were booked to return to Liverpool Street via Broxbourne on a normal service. The second was the South Bedfordshire Locomotive Club's Lea Flyer on 16th September 1961 which ran from Welwyn Garden City to Hertford North, back to Welwyn Garden City, then on to Luton Bute Street. After closure to passengers in 1951, the branch was used for the location of a number of films until the track was lifted in July 1967, with just a short section remaining to serve two factories, GKN Ltd and Norton Abrasives, near the site of Attimore Hall Halt. During the electrification of the East Coast Main Line the Hertford line was severed between Hatfield and Welwyn Garden City during the construction of a new flyover south of Welwyn Garden City. After this, the only access to the branch was from the Welwyn Garden City goods yard. Traffic to to GKN ceased in the mid 1970s although the siding officially remained open and by 1981 Norton Abrasives received one train per week with four to six wagons. The last working was on 12th November 1981 when a Class 31 collected empty wagons. Two weeks later two short pieces of rail were removed from the track at the point where the branch swung away from the main line and the remaining track was quickly lifted. Attimore Hall Halt looking west. 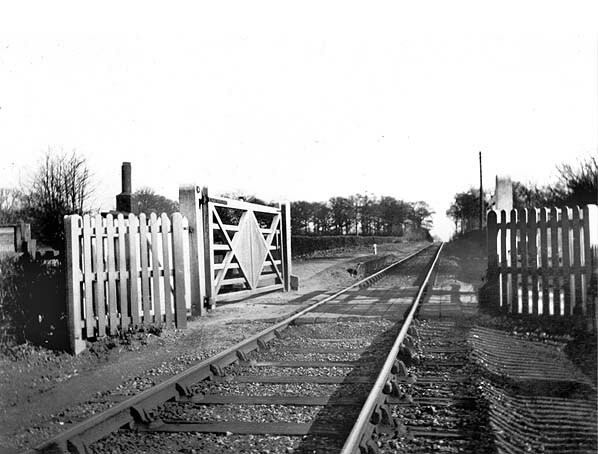 Looking west at the site of Attimore Hall Halt in 1974. A buffer stop can be seen in the distance, this was the end of the line at this time. 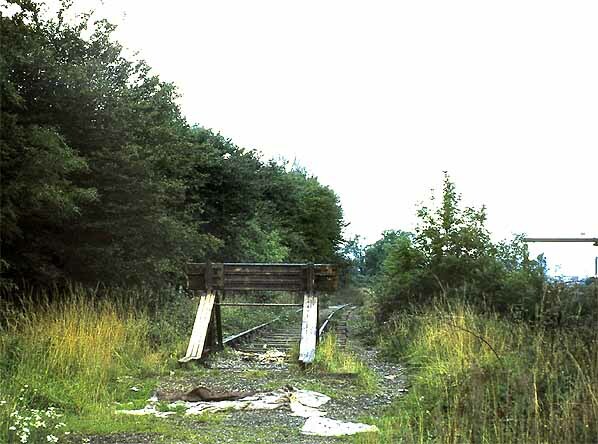 The end of the line (looking west) in 1974. The site of Attimore Hall Halt is 100 yards behind the photographer. Looking east towards the site of Attimore Hall Halt in December 2011. 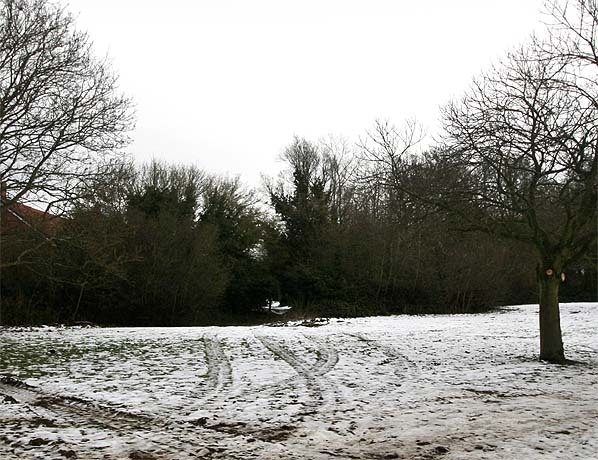 The road used to run along the edge of the wood but was realigned in the mid 1960s. 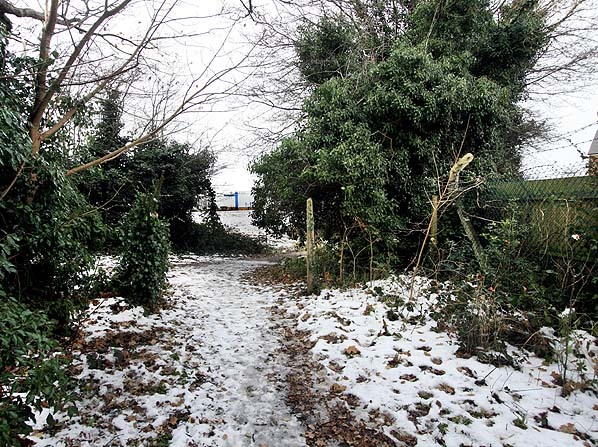 The level crossing was by the clearing in the trees and the halt was this side of the level crossing. Attimore Hall level crossing was on the far side of the concrete post and the halt was on the far side of the crossing.